RAIMENT --: RED HERO CAPE and Great meeting with smart ladies from RALEIGH REDRESS! RED HERO CAPE and Great meeting with smart ladies from RALEIGH REDRESS! Check out this great organization that is right up my alley (although active since 2009, I just learned about it recently)! They assist designers in getting their products seen and sold. Suggestions for me were to return to using the name and brand Raiment for the Fancy in You rather than Sewing for the Ages. This I am looking into. While I still use Raiment for much of my line, Sewing for the Ages was created to encompass designs for any age, for theatre, costume events, or just fanciful attire. It also included the offering of custom classes. Class offerings were not seized upon and may or may not happen in the future. Currently, my time is devoted to creating inventory and getting it through the sale process in various venues. I am definitely learning more and more about marketing in this on line world. Your thoughts? PLEASE STAY TUNED AS THINGS CHANGE AND GROW. Meantime, the shiny red HERO cape is being well received. Where is your HERO? Selling these for $25 and remember, they hold a secret pocket for your personal Thank You Note and later for the Hero's secret. See also on ETSY. 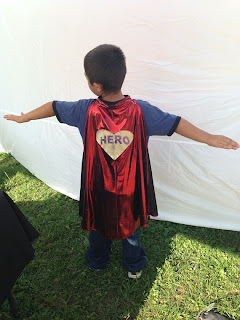 Search Sewing4theages - Hero Cape.